Southport play three Blue Square Bet Premier away matches in September. The Sandgrounders’ first trip is to Kidderminster Harriers, who have endured a slow start to the season, before travelling to promotion contenders Newport County and Luton Town. Details of the Trust in Yellow coaches are below. Under 16s can travel for a third of the advertised price if accompanied by an adult. Prices are based on a brake-even basis and a discount will apply if there are more than 30 bookings on any of the trips. 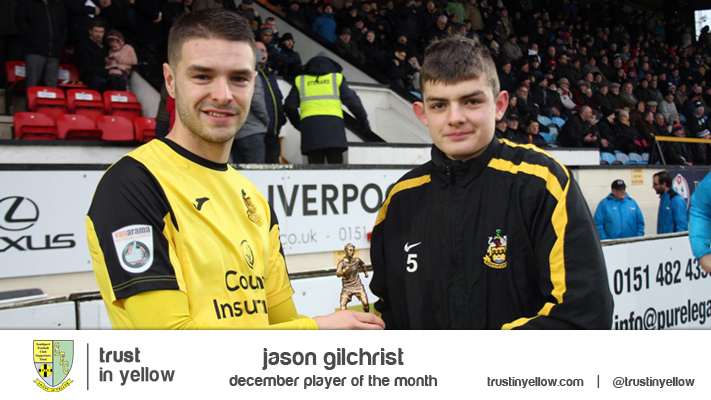 To book, call Alan Scarisbrick on 07980911693 or visit the Trust office on Saturday. Kidderminster Harriers, Saturday 8 September. Departs Haig Avenue at 11am. Price £18 members, £23 non-members, if paid in advance. Newport County, Saturday 22 September. Departs Haig Avenue at 9.30am. Price £29 members, £34 non-members, if paid in advance. Luton Town, Saturday 29 September. Price £28 members, £33 non-members, if paid in advance. To book any of the trips, call Alan Scarisbrick on 07980911693 or visit the Trust office on Saturday. 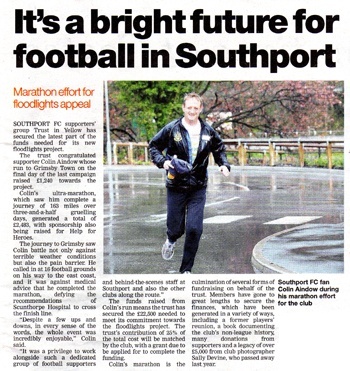 Trust in Yellow's fundraising activities for the floodlights project, including Colin Aindow's run to Grimsby Town in April, were featured in the Southport Visiter this week. The funds generated as a result of Colin's run to Grimsby mean the Trust has now reached its target of £22,500. 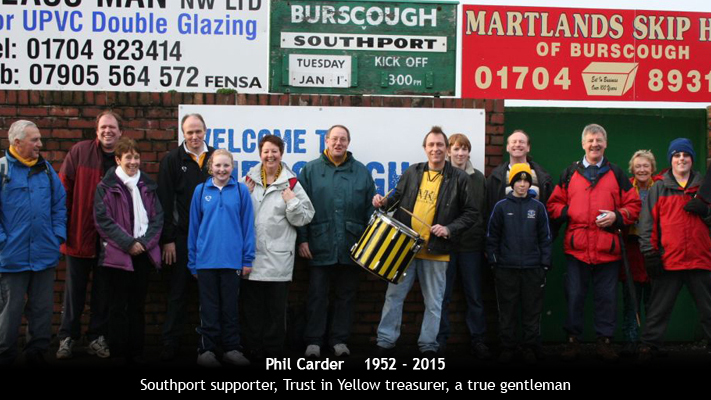 The Trust's fundraising has also recieved good coverage in recent weeks in the Southport Champion and the Non-League Paper. Thanks to the Visiter and Ron Ellis from the Champion for continuing to promote Trust news and events. 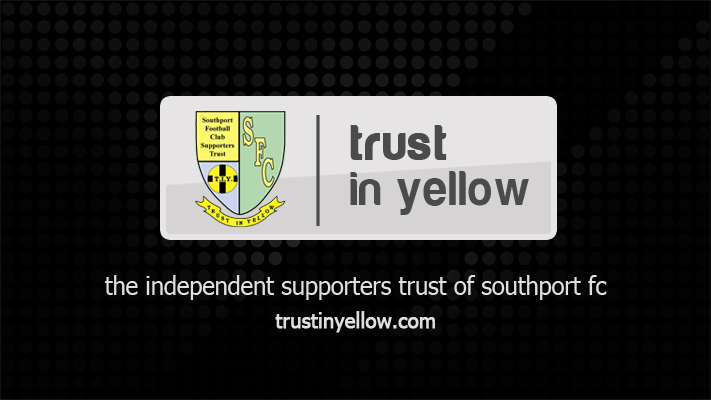 Seats are available on the Trust in Yellow coach to Southport's match at Hyde on Bank Holiday Monday. 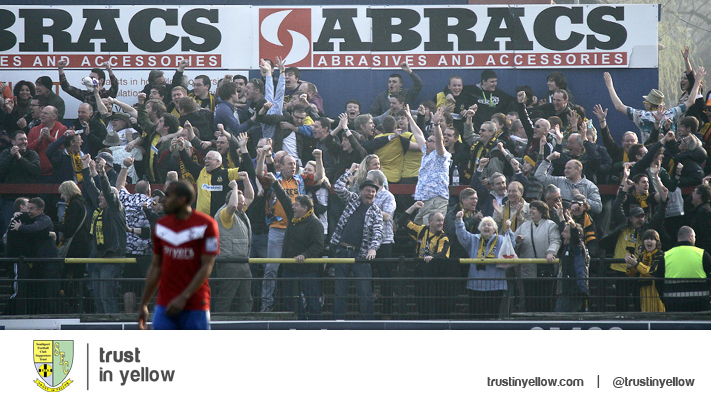 The coach departs Haig Avenue at 12.30pm, with the price of £11 for members, £16 non-members, if paid in advance. Under 16s can travel for a third of the advertised price if accompanied by an adult. A discount will apply if there are more than 30 bookings. To book, phone Alan Scarisbrick on 07980911693. Following on from the enforced retirement of Kevin Lee through injury, Liam Watson wishes to appoint Kevin Lee as part of his backroom staff. 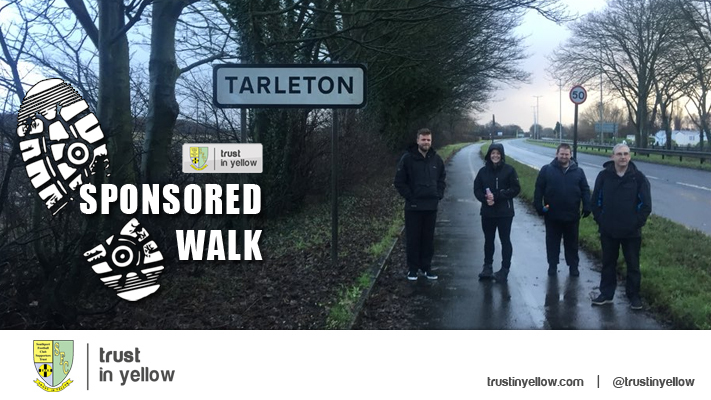 An independent group of supporters will be fund raising throughout the course of the season to raise £3,800. The £3,800 will pay to keep Kevin, a highly influential part of the 2009/10 Blue Square North Championship side and a key component of the clubs rise to prominence in the Blue Square Bet Premier as part of the backroom staff throughout the course of the season. For more details visit the website on www.supportkevinlee.com or e-mail info@supportkevinlee.com. There is also a twitter account, follow @support4kevlee to keep up-to-date with the latest devlopments.